WELCOME TO THE FA DIGITAL NEWSLETTER! a Ross Video production switcher. Are you looking for a technology platform for channel origination, playout automation and custom media workflow? 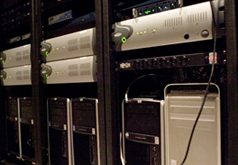 Give us a call and let us show you how our media server solution can help you! Finer Associates Shared Storage Server utilizing Tiger Technology software. Intel i7 6-core 4.0GhZ processor, 16GB DDR4 ram, Windows 10 Professional 64-bit OS, redundant 875 watt power supply, SSD boot drive, 96TB storage (approximately 70TB after Raid 6), unlimited IP based clients. 2 yr. warranty. Call today for a quote! MIT Production Services came to us when they were looking to outfit their new production facilities. 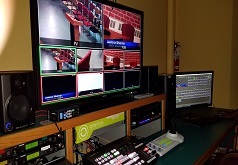 We were able to design and install a multi-definition production environment, utilizing state of the art high definition equipment. Our services included design, sales and integration. We recently outfitted CSHL with a petabyte of storage between an Infortrend raid and JBOD which we configured and integrated into their current system. We also custom designed and created for them an Intel raid 6 storage system comprised of 600TB.